We know we have people reading from all walks of life and from various points around the globe. We are thankful for every one of you. We also know that you found these Mile Markers for all kinds of different reasons. Many of you know us personally from church and revivals but many more of you arrived here after searching for information on a variety of subjects. Those subjects range from an interest in RV living, salsa, buses, evangelism, tent revivals, Gospel music, southern Gospel music, preaching, prayer, miracles, local churches, missions, Nigeria and who knows what else. We have been told by many of you that you came searching for information about one narrow subject and you stayed a while and have been with us every since. Thank you for hanging around. Since we have readers from such varied places, background and interests I sometimes wonder if I am writing about things that will keep you interested. For example, when I write about bus repairs I imagine that some of your eyes glass over with boredom. But I also know that many, many readers found this blog by Googling specific information concerning various repairs to a Prevost bus. Those are some of our more popular posts. Then once in a while a lady at a church will tell us they get so nervous when I write about the bus being in the shop. They are about to pace the floor just like I do. Then they will sometimes tell me to keep writing those posts because it lets them know how to pray for us. It is neat to watch that work. Yet I still worry sometimes when our life is consumed with one thing and therefore these Mile Markers are mostly about that one thing. For instance, last year when we were covered up with City Reach. I made the comment here that I hoped folks did not mind that we were writing about City Reach so much. Then a reader pointed out a paragraph I wrote as an introduction to this blog when we started in 2009. The full text is HERE but I have pasted the relevant paragraph below. Mile Markers are a good way to describe our updates from the road. They keep track of our progress as we move across the country. We post about the grace of God, great churches, Pastors, people, revivals, music, family, food, fellowship, fun, our travels and who knows what else. Thanks for stopping in to read our Mile Markers. That pretty much sums it up. I appreciated the reminder about that and it made me feel a little better. We post about pretty much anything that happens to be going on in our lives at the time and if that is City Reach for a year, then that is what we write about. If it is building a house then we will probably post a lot about building a house. Any other way would not be genuine. With that being said, the blog will serve as a journal of our house building adventure. 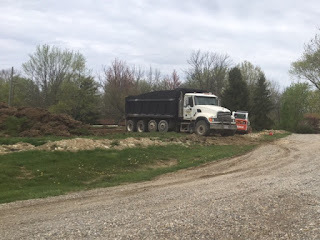 Today we have some pictures and a little description from the process of putting in the footer for the house for Odie to live in. Bro. David Butler began by renting a Bobcat and removing the topsoil from the building site. This is a picture of the first scoop. We will need all of that dirt and more to pile around the outside of the foundation walls. Thankfully we saved a bunch of dirt from the water ditch and once we throw that in, we should have enough. We will need quite a bit of gravel as good fill for the inside of the foundation. The gravel will be the base for the slab. Bro. Butler had six loads brought in and put on the house site. The rest will be put in by a slinger truck once the block walls are up. The next day Bro. Butler dug the actual footer. This is the very first scoop of dirt for the footer. Odie is a great supervisor! The next morning was our first actual construction inspection and Bro. David Butler's work passed with flying colors. Then it was time for 16 1/2 yards of concrete for the footer. This is the very first bit of concrete going into the ditch! It turned out beautiful. We appreciate Bro. Butler and his company, my parents and my brother Steve for their hard work to this point. The block is supposed to be delivered tomorrow and the block layers hope to start laying block toward the end of the week. Pray that the weather will cooperate.